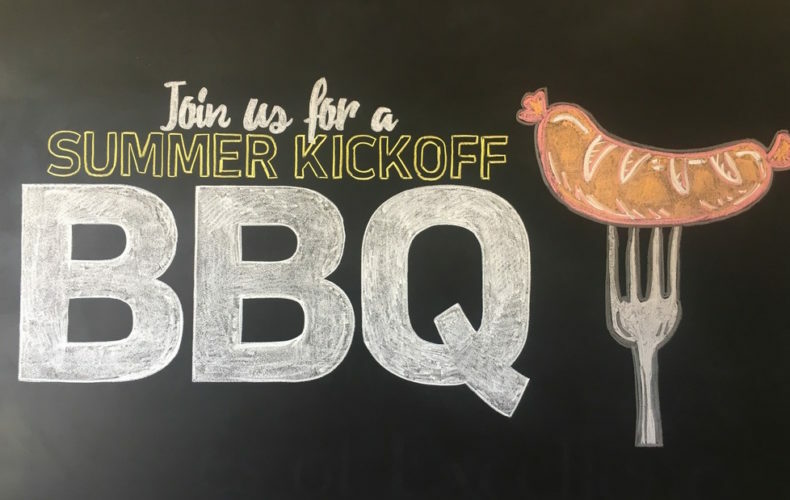 The Evergreen Media team lives by the saying “work hard, play hard”, as was evident at Evergreen’s 2017 Summer Kick Off Barbecue on Tuesday, June 20. After the day’s work winded down at 5 p.m., employees’ families, friends, and clients all descended upon our modern downtown offices for some grillin’ and chillin’. Attendees were treated to grilled cooking, cold brews from our “beer-barrow”, games, and great conversation. Lawn chairs were arranged on our building’s patio area as guests ate, drank, and laughed. Partygoers played frisbee on the side of 4th Street and corn hole was popular near the side offices. Evergreen’s designer, Chris, drew some of his infamous chalk art to welcome attendees. As these pups will tell you, publishing is a dog-eat-dog business. These canines have weaved through deadlines and have climbed the ladder to secure coveted positions here at Evergreen Media!